What is it that really distinguishes you, that separates you from the bunch, that makes your prospects sit up and take notice, and your competitors sit down in despair? The bottom line answer is – it’s you. It’s personal. Let me explain. To focus the conversation, please spend a moment with this great chart: “The B2B Elements of Value Pyramid” by Bain & Company. 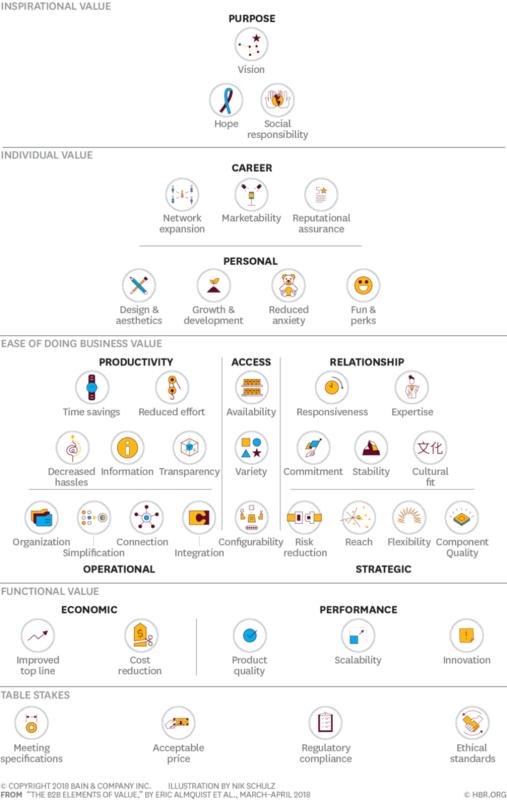 This chart, and it’s importance to B2B marketing, was featured recently in the HBR article “The B2B Elements of Value”, and referenced in Katie Martell’s excellent blog. The most objective kinds of value are found at the base, and the higher a level is, the more subjective and personal the types of value encompassed. Without going too far down a rabbit hole, this pyramid is based on the hierarchy of needs that the psychologist Abraham Maslow described. Maslow argued that human actions are motivated by an innate desire to fulfill needs ranging from the very basic (security, warmth, food, and rest) to the complex (self-esteem and altruism). We would argue that these values and insights can be extended to people in corporate roles to help us better understand their motivations for buying and using our business products and services. The lower the level, the more we are commoditized, the higher the level, the more defining, which is the substance of competitive differentiation. As the B2B marketplace becomes more crowded and homogenized (every website looks exactly the same and says the same things: does more, faster, cost-efficient), it becomes harder to distinguish ourselves. If we can’t effectively introduce a rationale for seeing us in a different, more discerning light, we will compete on the basis of price, like cornflakes. The point here is that marketing must become disruptively human and understand the full range of rational and emotional variables as the customer sees and describes them. Marketing must take the lead in forging messaging and communications based in that understanding, and embue it in their company’s culture. If we can capture the rational values (such as reducing anxiety or enhancing the buyer’s reputation) and engage with the customer on inspirational values and purpose, the more compelling is our message and the greater our competitive advantage. 1. Conduct independent, external qualitative research. The most important input comes from creating a persona or archetype of the buyer, replete with how they describe their challenges and the journey they take to their desired solutions. Product Marketing’s messages must address the intersection of each buyer’s corporate responsibility and personal ambition. In these structured conversations we can probe the ways we can own the lower level values and engage with them on the higher level. That’s what we call the creative process that yields messaging and content rooted in the insights generated from the qualitative research, quantitative analysis, and sales input. To be truly incisive, often we test the concepts and executions through the qualitative persona research process before we go to market. These steps are designed to produce both immediate and ongoing insights and executions. It’s up to you to listen, learn, and take action. 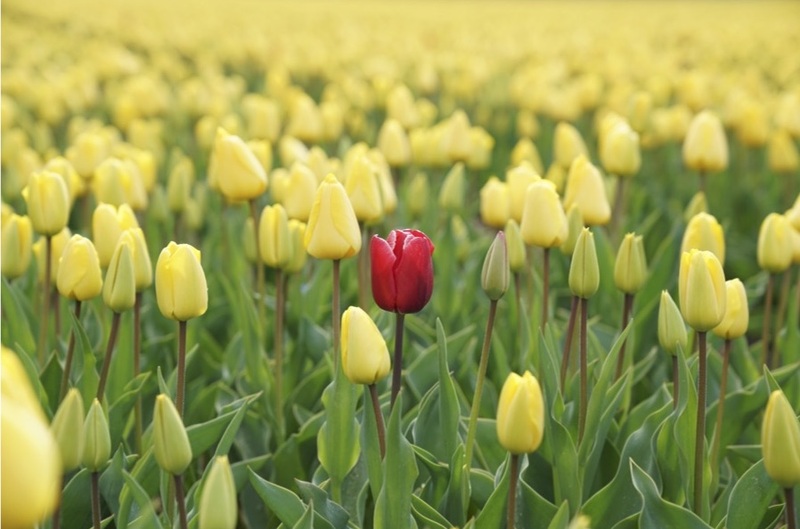 Rule #2: If you aren’t changing your competitive differentiator is toast. Here’s a good example of things done right: In a persona research interview I asked an executive, what is the single most important benefit of doing business with (the company sponsoring the research)? The reply: Management. They understand what we are trying to do, where we are trying to go. This entry was posted in Articles on November 2, 2018 by Scott Hornstein.